It’s clementine season! I snatched a box up the first minute I saw them in the grocery store and raced home. As usual I ate so many so often I got canker sores in my mouth from the citric acid. I don't care. At least I'm safe from scurvy! The orange peels piled up. I can’t compost citrus. I used most of the ideas I wrote about 10 Ways to Use Orange Peels. I still have a pile of orange peels. If I had the distillation equipment I could make pure essential oil from orange peels but I don't. Since I want to use this to give a citrus oil cleaming oomph to in my homemade cleaning products, I will make an orange oil extract (this is also called a tincture) instead. 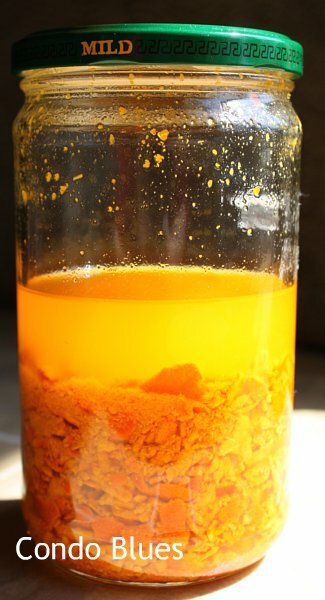 Orange oil extract is a bit less potent than a pure essential oil, so it doesn't really work well for aromatherphy, candle, or cold process soap making. I save real orange essential oil for those things. However an orange oil extract (tincture) works well for things like DIY cleaning products, melt and pour soaps, and homemade room sprays. You might need to use a bit more since an extract is less concentrated than a distilled essential oil depending upon how prominent you want the scent in your project. Knife or food processor (learn more here) - the food processor/chopper is easier! Disclosure: I included affiliate links for your convenience. Thank you for supporting free tutorials like this on Condo Blues! 2. Lay the peels on the cookie sheet, tray or towel and let them air dry (do not put them in a dehydrator or you will lose the oil!) until the peels are rock hard. It took my peels about one week to dry. 3. Use the food process/chopper/knife to cut the dry peels into small bits. Do not over process the peels in the food processor/chopper until they are mushy or you will lose the oil in the peel. 4. Add the chopped peels to the jar with the tight fitting lid and cover the peels in grain alcohol or vodka. 5. Shake the jar to release the oil several times a day for several days. The longer you let the peels steep the more orange oil you will extract. I let mine sit in a sorta sunny spot on my kitchen counter for a weekend. Freaky how it glows in the sunlight, huh? 6. Use a coffee filter to strain liquid from the orange peels and into the second jar. 7. Place a clean coffee filter or cloth on top of the jar of liquid. Allow the alcohol to evaporate from the jar. I let mine sit for one week. My orange essential oil after one week. Optional: I had sediment in the bottom of my jar of orange oil after one week. It isn't going to hurt anything. I had an extra disposable coffee filters that I know I wouldn't use for coffee ( I use a reusable gold coffee filter. It's supposed to make better coffee.) I strained the orange oil again with a clean coffee filter into an amber jar (a repurposed yeast jar.) A dark colored jar will keep sunlight from degrading the essential oil. The disposable filters came with a new coffeemaker. What you have left is a jar of orange essential oil! I added my essential oil to my homemade daily shower cleaner. The orange oil cut through soap scum like a house on fire! How do you like to use essential oil? Which one? If you'd rather buy than DIY, check out the products below! That's so easy! Essential oils are so expensive but it would be nice to add a bit to my cleaning solutions so everything didn't smell like vinegar. Farmer - I was surprised how easy it is. I was a disappointed I didn't get more essential oil from all of those orange peels. Now I know why real essential oils are a tad spendy. Do you have an idea of hoe much Orange peel you had and how much oil you got? You made this seem doable, and I'm thinking of doing this to my grapefruit peel from our tree....good idea or not? We love orange essential oil, and it would be nice not to have to buy it. Thanks so much for coming by my blog!! I love talking to other condo dwellers to commiserate about the storage and space issues! I hope you'll come by again sometime! How wonderful! I LOVE clementines or any orange really. Thanks so much for sharing this...I will definitely make it. Okay...you're wrong....it cannot be that easy!!!!LOL. Sorry couldn't help myself..your comment above is too funny. People have some nerve. Anywho, I'm also kickin myself..which isn't heard with my big..er...target. I just spent 19.99 at GNC on Oil of Oregano for mold and fungal allergy..don't laugh..I have horrible allergies year round and Vet..no comment please...told me abpout it. You put a drop under your tungue and it kills the crap. It's worked so far. So glad I found you thru Tree or More Tues.
How cool! I Stumbled this 'cause I had no idea you make this at home. I have some grapefruits form my CSA, I wonder how those would turn out. I think it's worth a shot. Melody - Yes, it's that easy. No I'm not laughing at you. I'm only kicking myself because I've been buying lavender essential oil for almost as long as I've been growing it in my front yard and only until now learned how easy it is to turn it into essential oil. D'oh! This isn’t my typical kind of project....but now I SO want to try it (as I sit here and eat an orange....) Thanks for sharing! Nifty! Thanks for linking up to Mad Skills Monday! I am in the middle of doing this and am on the last stage where the alcohol is evaporating out. I used a bowl and covered it with a clean cloth instead of the jar because it was too dirty. My questions are, during the alcohol evaporation, did it get really cloudy before it became that dark color? Also does the sediment float for a while before it settles at the bottom, or is it at the bottom from the beginning? Myla - The orange oil was cloudy during the evaporation stage and turned a darker color orange the longer it sat on the counter. If I accidentally bumped the jar, it kicked up the sediment and clouded until it settled again. That why I strained it one more time before I put it in the storage jar. Sounds great! I will definitely try it when I harvest my orange tree this winter. But you mentioned lavender, is that the same process to make lavender essential oil? Thanks. Okay so I had no idea it was that easy to make your own essential oils. I can't wait to try this - thank you! every now and then we buy a whole bag of oranges and juice them all at once. what a treat! then i throw the peels into the garden to keep the cats away. so this is wonderful to know how to make the oil. can't wait to have some fresh juice! I just bought a bunch of tangerines on sale, and I was hoping Id find a way to make oil as I make my own cleaners, this is awesome! I will be making it, I will be blogging it and I will be linking you with a big thank you! I use my orange oil in homemade cleaners too. My friend just sent me the link to your post....after days of searching I couldn't find anything on how to do this. But, it was probably just me. :) This sounds soooo easy I am in S. CA and the citrus is ready! I am now picking as many of the fruit from around the nieghborhood that I can get my hands on. I have dry skin and was turned on to some a great remedy, that I'll share. Make orange water with oil, and put in a spray bottle. Spray your bod with the water and then slather olive oil all over. The Orange water acts as a vehicle to move the oil evenly across your skin without the sticky buildup. And to keep from smelling like a salad put a couple of drops of the Orange Oil in your bottle of Bathroom Olive Oil. Your skin has never looked and felt so wonderful! This isn't an essential oil either. It's an extract. I think as someone else mentioned this is more of an extract than essential oil. Difference being: essential oils are created by steaming peels in a closed container, steam travels via connecting tube to a condenser, where the oil and water vapors are cooled and separated. One site I found mentioned that this method negatively affects the aromas of citrus. To what degree was unclear. With either method the oil migrates to a liquid and distills by evaporation. I don't know what difference there is between the two methods, and I'm no expert. At any rate, I think your method may be a better solution because it doesn't require special equipment to produce. Just a quick mention, if you're planning on using this for purpose besides cleaning, make sure you use organic peels. You don't want to be smearing (concentrated) pesticides / herbicides all over sensitive facial skin (or anywhere else on your body). And even if you're just going to clean with it, why not do a good turn for the environment and use organic anyway? Can I use rubbing alcohol instead of vodka? I tried using rubbing alcohol once and it was an epic fail. They add scent to rubbing alcohol to make sure you don't drink it. That scent doesn't go away once you evaporate the alcohol from the mixture - blurgh! Nyllix is correct. This is extracting the oil from the orange peel, but it is considered a tincture, not a pure essential oil. A pure Essential oil is extracted several different ways....usually with a still, citrus oils are expeller pressed. a pure Essential oils has no additives, it is the true oil only. Can I use this same process on Lemons? I can't seem to find a similar tutorial on lemons. It might be worth the $15 buying it if I have to cook it for 5 hours in oil. I haven't tried it with lemons but I'm sure it will work. I used the same technique with the lavender I grow in my garden. The key is to dry the peels out first to concentrate the oil in the peel. Exactly how much Vodka do you use? I use an Orange Oil for the purpose of dusting/cleaning my wood furniture. Can I incorporate this to some sort of oil? Thank you! I am excited to try it. I posted a link to this tutorial on my blog since i will be trying this! And to think I just bought lavender oil. Oh well, maybe I'll break down and buy cheap vodka (never bought ANY before, cheap or spendy) and try the orange oil. While I'm at it, maybe I'll try vanilla too. Never made that before either. Do you have a tutorial for that?? Thanks so much for sharing this!! By the way, I love the smell of orange when dusting, but I didn't know I could put it in my shower cleaner too. Will tangerines work? Or only oranges? Thanks! I'd love to use this recipe for tangerine essential oil to add to a gel candle- is this oil considered non-polar- do you know? And does it have a combustion pt above 170 degrees? The oranges are soaked in vodka which is combustible. I'm sure even after allowing the alcohol to evaporate there may be vodka in the mix. I personally wouldn't use it in a project involving fire just in case it is still combustible. Would this be good for soap making too? I make mine using distilled white vinegar. It's used for cleaning, especially when I use it to make a paste with baking soda. I'll have to try it this way next time. Just wondering because we're going to use this as our Investigatory Project. Won't the peelings rot if it will take a week or more to dry? Is it okay? Please reply. :) We're going to use Philippine Lemon peelings. Is this safe to add to candles?? I have a bunch of soy wax and was looking for a way to make my own essential oil since it smells better in candles. But it's so expensive! This is a great money saver but I don't know if it would be safe?? I use mine for cleaning. Since it is made with alcohol which is highly flammable, I'd be afraid to but it anywhere near something that burns. My citus peels (I do this with lime too) dry fairly quickly without rotting but I haven't dried them when there is a lot of humidity in the air. I'm not sure how it will work in your climate. I say go for it! This is good news.I`m will use my Orange Oil as a "Weed Killer"...no "Round Up" here. I followed your instructions and made my own!